With more and more businesses and schools installing mains fed water purifiers, it is important to note the added advantages of using these convenient water dispensers. Schools are fast becoming one of the most popular locations for water coolers and fountains as the greatest benefit of water is the advantages that it offers students. Correctly hydrated individuals have a higher level of concentration and will perform better mentally and physically. 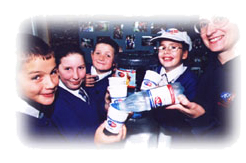 As children are undergoing rapid growth and development for most of their school careers, it is important to ensure that they are correctly hydrated. The human body consists of over 75% water and children need to constantly drink water to ensure they maintain hydration. Water is the most important nutrient know to man, as without it no other nutrients can be transported around the body. Our bodies require adequate hydration to metabolise and perform any and every function. Dehydration can cause a decrease in mental performance, increased body weight and a higher risk of cancers. The biggest cause of dehydration in young children is the fact that they have not developed the correct responses to understand thirst. It is often confused for hunger by parents, leading to children being fed more than they need. This is a possible cause for the rapid increase in child obesity in the UK. Companies like AquAid can assist you to select the best water cooler for your facility and they will help you to plan and position their placements to ensure everyone gets clean, fresh and safe drinking water.regular intervals.